Veritus is continually exceeding our expectations and offering new and innovative services to meet our needs. As a leader in the disability and career management field, we at Veritus embrace change. We think expansively to ignite growth and apply the industry's best practices to provide superior service. That's why we are excited to launch this guide designed to support clients while they are finding their way to meaningful work. 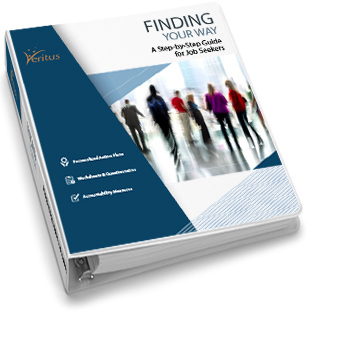 Step-by-step, the guide walks individuals through valuable assessment tools, strategic tips, and expert advice on how to excel in every aspect of their job search in today’s evolving career marketplace. For more information, please call, 204-949-1030.